What was U.S. Secretary of State John Kerry’s mission on his working visit to the Kremlin to discuss the Syrian crisis with Russian President Vladimir Putin and Foreign Minister Sergei Lavrov? Russian analysts believe the U.S. position has manifested a certain flexibility, though they appear no closer to agreement on the main issues. There has been progress in identifying legitimate members of the splintered Syrian opposition, but U.S. Secretary of State John Kerry's working visit to Moscow on Dec. 15 failed to yield any substantive agreements. During his talks with Russian President Vladimir Putin and Foreign Minister Sergei Lavrov, they failed to narrow the divide on the issue of the political status of a post-war Syria, or on the future of President Bashar al-Assad. Three key issues were discussed in the Kremlin; regulation of the Syrian crisis, implementation of the Minsk agreements to resolve the conflict in eastern Ukraine, and bilateral relations between Russia and the U.S.
Lavrov described the talks as "objective and concrete" in a press briefing. Kerry said, despite contradictions between the positions of Moscow and Washington, “we have shown that when Russia and the U.S. move in one direction, progress can be reached." A primary outcome of the meeting, according to Andrei Kortunov, general director of the Russian Council on International Affairs, was agreement on a precise list of the Syrian opposition forces that can be called potential partners. Russia and the USA were unanimous that the Islamic State and the al-Nusra Front, the local branch of Al-Qaeda, will remain outside the framework of any political process. Kerry said Washington and Moscow's positions have really converged on this issue. Another important outcome is the forthcoming ministerial level meeting of the Syrian support group in New York on December 18, in which Lavrov will take part. Russia expects that the meeting will lead to the UN Security Council reviewing the agreement on Syria drafted in Vienna in November. "This meeting will serve as an additional impulse to the Vienna process, it can result in the concretization of certain phases and show the nature of the transitory political period in Syria," said Kortunov. However, there have not been any changes in Moscow and Washington's positions, with attitudes to Assad’s fate remaining unaltered, even though the Americans reportedly demonstrated a certain flexibility. 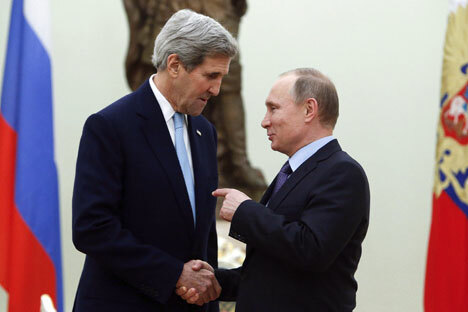 "The U.S. is no longer adamant about a regime change in Syria," said Boris Dolgov, senior scientific collaborator at the Centre for Arab and Islamic Studies at the Russian Academy of Sciences, citing Kerry. "We had said that the U.S. doesn't believe that Assad has any possibility to remain leader of Syria in future. But today we have concentrated our attention not on our differences, not on what should immediately be done with Assad. Today we have concentrated on the political process," Kerry explained after the talks. And this, in Dolgov's view, is a “new” word in American rhetoric. But this flexibility should not be perceived as Washington's desire to put an end to the crisis in relations with Russia, said observers interviewed by RIR. The United States’ objectives in the Middle East still differ from Russia's objectives, and their positions on other key world policy issues also diverge.